Such “tolerance” is usually a one-way street. Advocates of Catholic morality are always told to “tolerate” disordered sexual behavior even when they or their children are harmed or offended. Those who advocate homosexual behavior seem to forget about tolerance when it comes to Catholic morality. Parents immediately expressed their concern and protest. Many did not see such behavior as a proper model for their children. Parents defending their fundamental rights to educate their children were naturally upset and demanded an explanation as to why a man masquerading as a woman should be allowed to teach. School officials met with over 150 parents in August to hear their concerns. A group of parents sent in written requests asking, not that the teacher be fired, but only that their children be removed from his class. 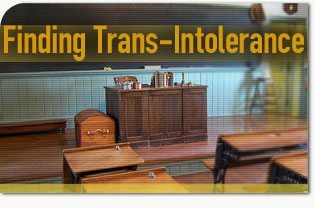 In a spirit of “tolerance,” it would appear that the school district would at least honor the exclusion request of those who were offended by the development and quite reasonably wanted to safeguard their children from being taught by someone suffering from what is officially classified as a mental disorder. Alas, that was not the case. Superintendent Richard Stutzman Jr. claims that it is district policy to only permit changes for academic reasons. Students and parents would simply have to accept it. Parents were further warned that “gender identity disorder (GID)” is considered a disability and protected under New York law. Such efforts to “normalize” the transgender disorder can be found nationwide. The disorder is fast becoming yet another case of bending science to fit a politically correct agenda. With little or no scientific evidence to back up their demands, many are calling for a declassification of GID as a mental disorder. Others affirm that there is no “normal” gender identity. Many insist that it should not be treated clinically. Legislative efforts are right behind the pseudo-scientific ones. Indeed, the transgendered “T” is part of the GLBT agenda found everywhere. Like it or not, this agenda is being forced upon mainstream America. Even when those defending Christian morals are directly affected, they are given no choice. In other words, in the name of tolerance, opposition to gender identity disorder is simply not tolerated. Those who wish to politely e-mail their concerns about the situation should contact district Superintendent Richard Stutzman at rstutzman@bataviacsd.org. This entry was posted in Events of 2006 by John Horvat II. Bookmark the permalink.